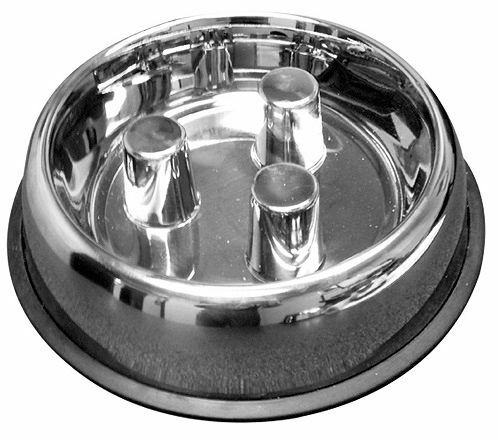 Patented brake-fast dog food bowl design prevents your dog from eating their food too fast. The simple obstructions make dogs slow down to eat. Brake-Fast® patented slow feed bowl made from hygienic stainless steel. Available in small, medium, and large size. Vet recommended! Slower eating makes an animal feel more full and reduces instances of 're-eating'. Elegant, no-tip shape with removable non-skid rubber bottom. Small Size (2 cups) 6" across the top and 2" tall. Medium-sized (5 cups) and 8" across the top and 3" tall.